ABM Engineering Services assists USAA Real Estate Company in achieving 25% reductions in energy and water use throughout USAA's commercial portfolio. A&P partners with Advantage IQ and uses ENERGY STAR benchmarking to drive energy savings. 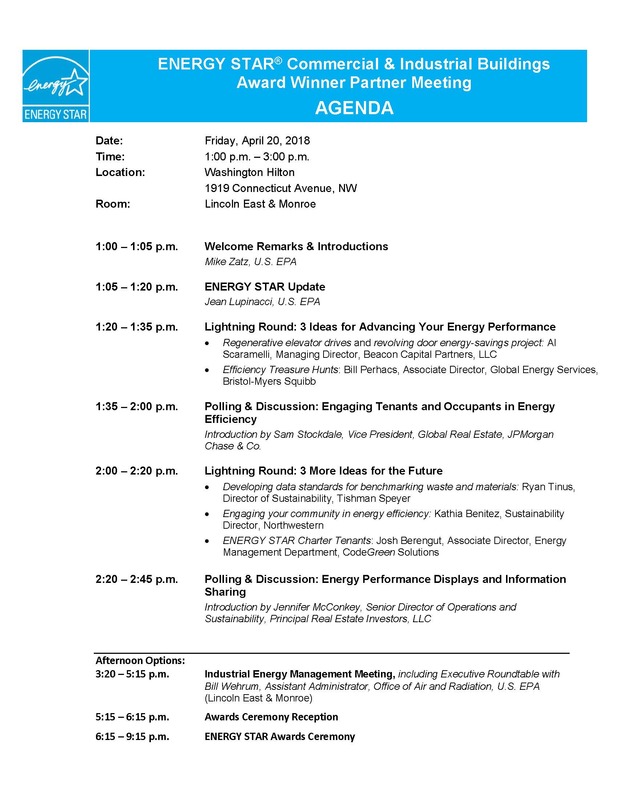 Each year, EPA holds a meeting for ENERGY STAR Award winners prior to the awards ceremony to share best practices and highlight trends from the owners and operators of high-performing portfolios. In 2018, the meeting will be held from 1:00pm-3:00pm at the Washington Hilton (the same hotel as the awards ceremony). Use this tool to benchmark the energy performance of aluminum casting plants and determine the plant's ENERGY STAR 1 to 100 energy performance score. Elmendorf Air Force Base undertakes an energy savings performance contract with Ameresco focusing on a heating system decentralization that produced over $5 million in savings in year one alone. Hill Air Force and Ameresco Landfill Gas Generator Energy Project is the first of its kind for the Department of Defense and the State of Utah. This one-page Provider article tells how proper installation of new equipment and diagnostic testing of existing systems can achieve surprising levels of energy efficiency, even in older buildings. Use this three-page guide to get a brief overview of some of Portfolio Manager's most basic functions, such as how to navigate through the tool, enter building data, and connect and share data with others.